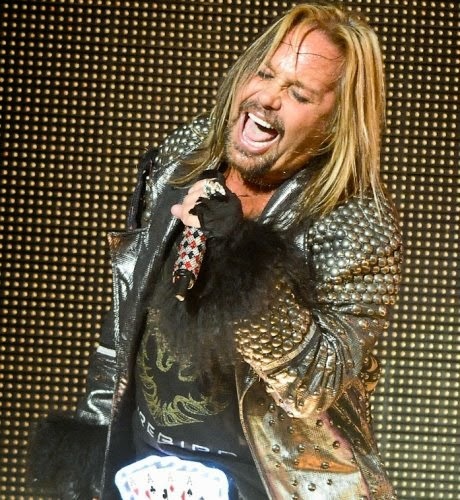 Motley Crue singer Vince Neil and his company, Rockstar Sports Group, have been awarded an expansion team in Las Vegas by the Arena Football League. AFL Commissioner Jerry Kurz made the official announcement during the 3rd quarter of the 2014 Arena Bowl (XXVII), which was broadcast live on ESPN, August 23rd. Neil, together with his business partners in Rockstar Sports Group - Bob Hewko, a former Florida Gator and Tampa Bay Buccaneer’s quarterback, aviation businessman Mark Daniels, and technology businessman Sohrob Farudi - will set out to begin building the Las Vegas based team named the Las Vegas Outlaws. Vince and his partners had become minority owners of the AFL Jacksonville Sharks in April this year, however saw the opportunity to acquire an expansion team for the Las Vegas market and jumped on it. With the award of the Las Vegas team, the minority ownership in the Jacksonville team will be divested in compliance with AFL regulations. Neil’s ownership venture into the AFL follows the recent purchase and launch of the LA KISS by KISS members Paul Stanley and Gene Simmons. Motley Crue wrapped up the first leg of their farewell tour in at the Darien Lake Performing Arts Centre outside of Buffalo, New York last weekend. North American dates will wrap up November 22 in Spokane, Washington.